Free Shipping Included! Sliding Bath Transfer Bench with Replaceable Cut-Out Seat (77311) - Regular (Base Length: 39'' - 40'') - Heavy-Duty Shower Bathtub Chair - Eagle Health Supplies by Eagle Health Supplies at Muscle Pain Relief Rubs. MPN: 77311. Hurry! Limited time offer. Offer valid only while supplies last. SPECIFICATIONS: Seat Size: 17.75'' x 14.75''. Seat Height: 18.25'' - 22.25''. Base Length: 39'' - 40'' (Regular) (From outside-leg tip to outside-leg tip). View More In Mobility & Daily Living Aids. SPECIFICATIONS: Seat Size: 17.75" x 14.75". Seat Height: 18.25" - 22.25". Base Length: 39" - 40" (Regular) (From outside-leg tip to outside-leg tip). Base Depth: 18.25" - 20". Max Tub Clearance: 18.5". Back Height from Floor: 32" - 36". Sliding Distance: 15". Weight Capacity: 400 lbs. (Dimensions are approximate and subject to change without notice; generally within ±0.75" tolerance). LONGER LENGTHS AVAILABLE: #77381 (Base Length 43"-44") & #77391 (Base Length 48"-49"). OPTIONAL ARMREST AVAILABLE: #75003 (Single) - (NOTE: Armrests are not designed to bear body weight. They are only intended to rest your hands or arms on). Please measure your bathroom and bathtub carefully to make sure this product will fit your specific needs. This is a non-returnable hygiene item and cannot be returned once opened. SAFE & RELIABLE: Our innovative Sliding Transfer Bench w/Cut-Out (77311) by Eagle Health Supplies makes getting into and out of the bathtub easier, safer, and will give you or your loved ones a sense of confidence, safety, and steadiness in the bathroom. It can give you the independence and dignity to bathe yourself without assistance. Or it can help you or caregivers assist your loved ones in the bathroom. 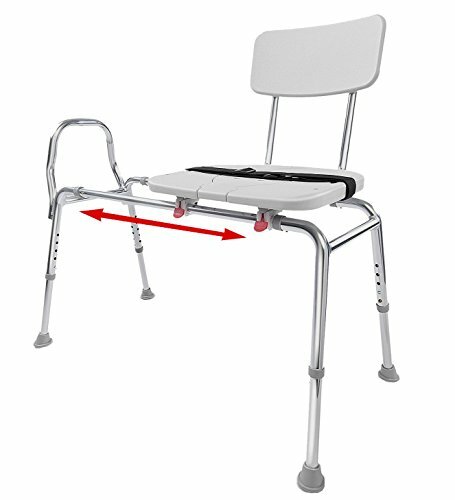 INNOVATIVE & CONVENIENT: Easily glide into the bathtub or shower without having to scoot across the seat like a conventional transfer bench. And our sliding bench can help you save money by costing thousands $$$ less than installing an expensive walk-in bathtub or shower. Includes adjustable safety belt. Please measure your bathroom and bathtub carefully to make sure this product will fit your specific needs. This is a non-returnable hygiene item and cannot be returned once opened. OPTIONAL ARMREST AVAILABLE: #75003 (Single) - (NOTE: Armrests are not designed to bear body weight. They are only intended to rest your hands or arms on). If you have any questions about this product by Eagle Health Supplies, contact us by completing and submitting the form below. If you are looking for a specif part number, please include it with your message.